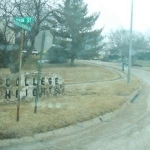 We have not been able to track down the exact address of this report in the College Heights Subdivision. College Heights is a housing subdivision in Sarpy County, Nebraska. We have not solidly verified whether or not there was an Indian Burial Ground in the College Heights area, however, 2 miles away, on the Bellevue College campus, Chief Big Elk was originally buried and then exhumed to be reburied at Bellevue Cemetery along with fourteen of his braves. The owner of a home in the College Heights Housing Area have apparently reported unexplainable noises and events in the house. An apparition has been seen standing at the end of the owner’s bed. Objects would fall or be pushed onto the floor while the owner was in a different room. The College Heights Subdivision is situated right beside an “Indian Burial Ground” or at least a cemetery where the last of the Omaha tribe’s chiefs is laid to rest (Chief Big Elk). 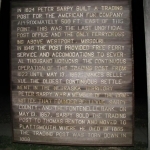 It is also located within the vicinity of Jewel Park. The report of paranormal activity was specific to a particular private residence (the address was not indicated in the report). The location of the subdivision so near to a cemetery makes the report of paranormal activity interesting to consider.